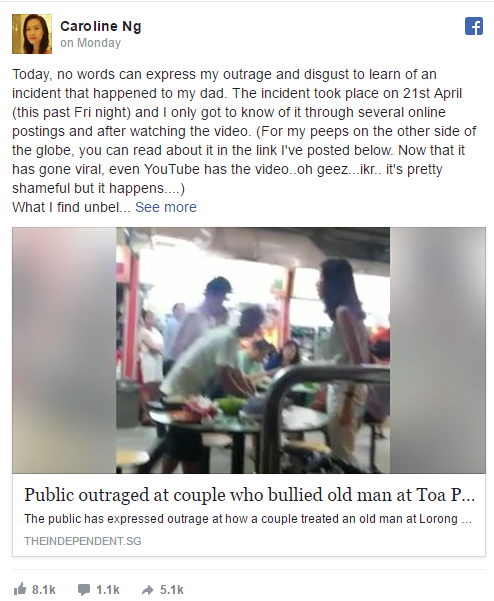 Ms Lim, 50, said that the elderly man, who was holding a tray of food, was asking the woman how many people were sitting at the table. The woman replied in irritation: "Can't you see it's reserved", Ms Lim said, adding that there was a small foldable umbrella on the table. There was also dirty dishes and leftover food from previous patrons. The elderly man said he could not, and repeated a few times that he just needed one seat, but did not raise his voice. 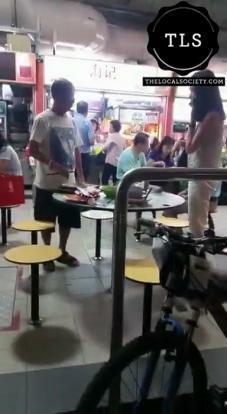 According to Ms Lim, he also asked the woman what she meant by "reserve", as the hawker centre was a public place. 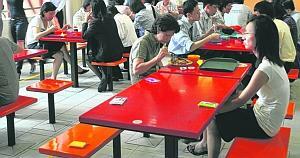 Singapore’s food centre chope culture: Is it practical or plain rude? It is 1.00pm at Maxwell Food Centreand the popular hawker centre is bustling with a lunchtime crowd. A Hong Kong tourist, Ms Abbie Lam, 24, with her 3-yr-old niece in tow, approaches a table where a man in office attire sits, surrounded by 5 unoccupied seats. Perspiring after hunting for seats for the past 10 minutes, Ms Lam is about to sit down when the man tells her all the seats are taken. He gesticulates to their “occupants” – one name card on each seat. 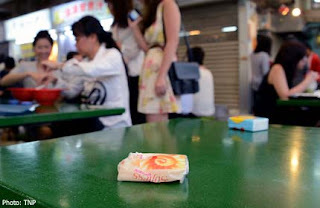 There is one issue which the Hawker Centre 3.0 Committee should address - the use of packets of tissue paper to "chope", or reserve, hawker centre tables ($90m fund lined up to boost hawker trade; Mar 9). This practice is common among the lunchtime office crowd. 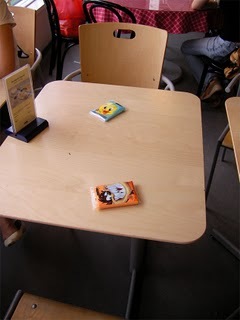 For instance, tables for 5 or 6 are reserved with tissue paper, depriving single customers of a seat. It is also not uncommon for a group of diners to stay on at the table after eating, chatting, playing games on their mobile phones, surfing the Internet or returning calls, oblivious to others who are looking for a seat. Why fix the practice of “choping” when it’s not broken? After reading many so-called points from the opponents of the "first come, first chope" system in the media, I still did not see any good argument to thrash the system. For that I have communicated with Dr William Wan( the General Secretary of the Singapore Kindness Movement) who has expounded to do away with the de-facto choping system in the newspaper and in in the Hawker Centre 3.0 Committee which he is a member, on emails to ask him for any good reasons for doing this. All he could say was only that (paraphrasing) it's his opinion that "choping" is ungracious, and he wouldn't want to engage in a course of reasoning to make his point. So what's so ungracious about the "choping system"? Singapore's food centre chope culture: Is it practical or plain rude? It is 1pm at Maxwell Food Centre & the popular hawker centre is bustling with a lunchtime crowd. 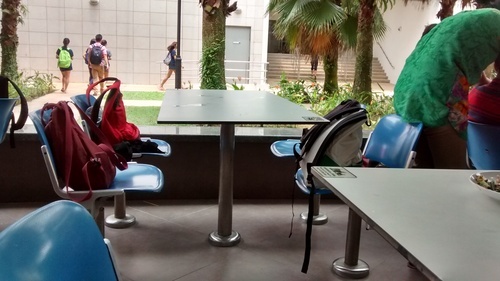 A Hong Kong tourist, Ms Abbie Lam, 24, with her 3-year-old niece in tow, approaches a table where a man in office attire sits, surrounded by 5 unoccupied seats. Perspiring after hunting for seats for the past 10 minutes, Ms Lam is about to sit down when the man tells her all the seats are taken. He gesticulates to their "occupants" - one name card on each seat. Singapore has one ugly side “reserving” table with a packet of tissue. 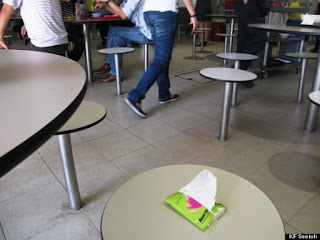 I see no reason for me to entertain that packet of tissue and I feel embarrassed when foreigners ask me why can’t he take the seat. The Singlish phrase ‘chope’ needs a dedicated post. Although everyone goes on about tissue paper packets in food courts and coffee shops, the word ‘chope’ has an interesting history. 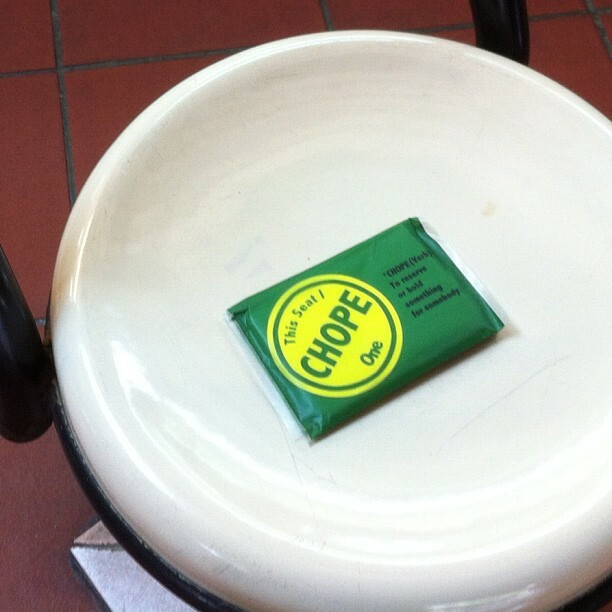 The Singlish word ‘chope’ (Slang for reserving a seat) was derived from chop; to leave a mark. 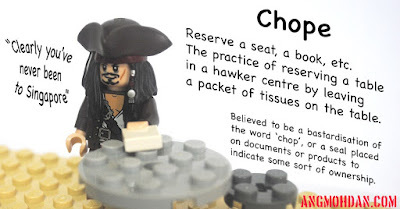 The word ‘chop’ was originally from the Malay word cap, which is from the Hindi word छाप ćhāp (stamp). 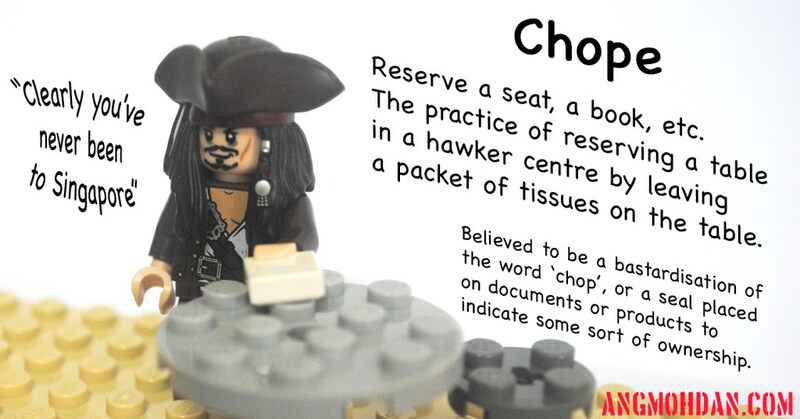 ‘Chop’ and ‘chope’ are sometimes sounded the same because of the blending of the vowel sounds. Normally when a silent ‘e’ occurs at the end of a word, it converts a vowel to is ‘long’ equivalent. In Singapore, these two sounds are blended into one sound, and the diphthong is kept short for ‘oh’. 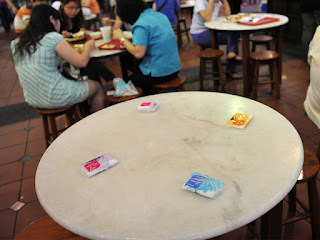 Lately, there’d been some controversy in the local news about using tissue packets to reserve your seats in hawker centres, food courts and coffee shops. For foreignors or tourists who are unaware (Of course, they would be unaware and probably feel delighted that there’s a ton of free tissue packs lying around), this is a unwritten rule in these eating places where a pack of tissue placed on the table or seat means it’s reserved so everyone can go buy your food without having one poor soul left behind to man the table. Some people think this practise defies social etiquette because it’s just plain rude while some people think it’s ok cos they do not see what’s the problem plus a long list of reasons. Some see this as a Singaporean culture while some think it’s reflects bad behaviour and lack of social graces. Whatever, whatever…….. 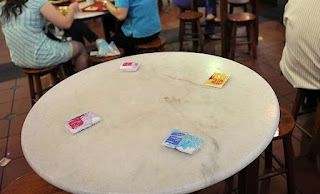 It appears that more sections of the public are fed up with what’s possibly a “Uniquely Singapore” style of making reservations at food courts and hawker centres – putting tissue packets on tables to “chope” seats. Upping the stakes, some diners go so far as to leave personal items such as handphones, car keys, umbrellas, work files on empty tables to mark their spot. The food in Singapore is so amazingly good, and so affordable, that I’ve taken to buying my lunch in the university canteen every day, and Andrew and I will often eat out of an evening. Thankfully some friends introduced us to the fine art of Singaporean ‘chopping’ to help us navigate the logistics of canteens and food centres. These centres can be a few different shops, or up to twenty (and many more at larger ones) all of which will only cook one genre or specialty. There are also separate beverage stalls. Navigating this with several people can be tricky. 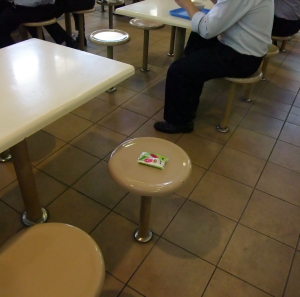 Singaporeans negotiate this by making sure they 'chop’ a table before ordering food. This can be as simple as leaving a packet of tissues on the table, or as elaborate as leaving your entire bag. [on a tangent, I’ve seen the slogan “low crime does not mean no crime” around - clearly attempting to prevent this kind of complacency that would never happen anywhere else]. Here’s an example of 'chopping’ I took a photo of at lunch one day. The word is more or less the same in function as the Australian English bags (“I’ll bags/chop us a table while you get drinks”), but I like it better. It’s quickly made its way into my daily vocabulary! Weekday lunchtime in Singapore’s central business district is probably the epitome of when everyone gets their best chope face on. These lunchtimes are immensely crowded, everyone’s hungry, and the air is humid and stale from a roiling mass of people. That’s when competition to find a seat is strongest. 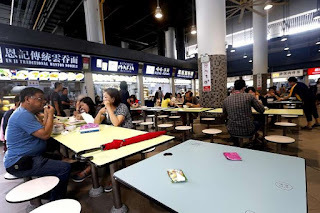 Harried office workers beadily eye tables at food courts and hawker centres, much like vultures circling their prey, for that opportune moment when seated patrons finish their meals and leave. 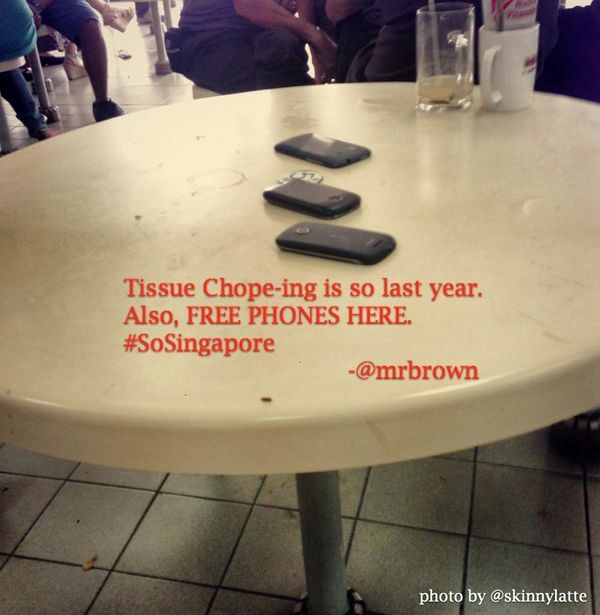 In a flash, those waiting around swoop in to place a tissue paper packet on the table – chope! This table is mine and you ain’t getting up in my space. Several times since living over here I’ve found myself being saved by the humble tissue packet—an invention that I’ve come to regard as ingenious. Absolutely necessary if you live in or visit Singapore. “But it’s just tissues,” you may say. Wrong. Besides your usual snot rag, these little portable packets have a myriad of uses. Let me count the ways. For many of you, (for most, if not all) you won’t be familiar with this term. To chope or “reserve” a table is the only way you’re going to be able to eat a good cheap meal at a Hawker Center around here. 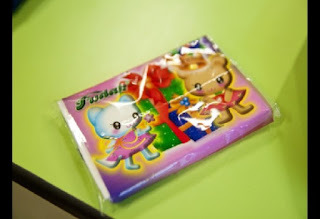 The practice of choping follows: If you see an open table, reserve your spot with your, wait for it… tissue packet, and proceed to the food stall to order your food. By placing your tissue packet in the spot on the table, it’s a universal sign that this seat is taken. 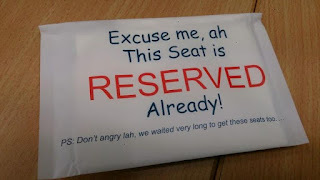 Don’t try to leave an article of clothing or a newspaper or any other item to reserve your seat, though. You’ll come back to an occupied table with your belonging pushed aside. I’ve grown quite fond of this system. There was a time in the not so distant past that this practice was viewed with disdain. It was even featured several times on a certain citizen journalism portal as an ungracious practice – until Singaporeans decided that this was actually a pretty efficient and effective way of securing seats for a meal at hawker centres. Reader Wilfred Wong shares - 'I heard about this story where an undergrad used her laptop to chope a table in the school canteen. Of course, the laptop disappeared. She asked the cleaning lady if she had seen anyone taking it.